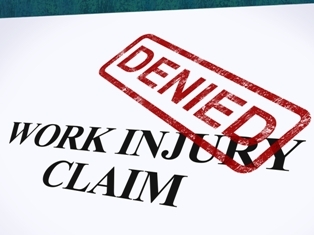 Was Your Workers’ Compensation Claim Denied for One of These Common Reasons? If you are injured on the job or developed an occupational illness—such as a serious respiratory condition or cancer—you expect to receive the workers’ compensation benefits you are entitled to. After all, you have done your part and been a hard-working, dedicated employee. You may be shocked when you receive a letter from your employer’s insurance carrier denying your claim. Unfortunately, this is all too common. But don’t just accept this. You need to contact an experienced workers’ comp attorney who can help you fight to get the compensation you deserve. Your injury was not witnessed. Insurance companies never like claims where the worker’s injuries were not witnessed by others, and they routinely deny these claims. However, you had no control over whether another employee was present and should not be punished for this. Just be certain to report your injury promptly to your supervisor and tell everyone the same thing about how your accident happened. You failed to report your injury immediately. Insurance carriers are also suspicious of accidents that were not reported right away. The adjuster often doubts the worker was really injured or that he was injured on the job. Under New Jersey law, you are required to report your injuries within 14 days of your accident. Ideally, you should notify your supervisor of your accident immediately and fill out an accident report even if you do not believe you were injured. The reason for this is that you may not realize you suffered an injury as some conditions—such as traumatic brain injury or back or spinal injuries—can take days or weeks before you experience any symptoms. There are discrepancies between the accident report and medical records. If you state your accident occurred one way on your employer’s accident report and another way to your doctor, it is likely that your claim will be denied. This would make the insurance adjuster doubt that you were really injured at work and can hurt your workers’ compensation case in general. You want to be consistent in how you report your accident and injuries to your employer, doctor, co-workers, family, friends, and your attorney. Your medical records indicate you were intoxicated. If your initial medical records right after the accident indicate that you had illegal drugs or alcohol in your system, there is a strong likelihood your claim would be denied. While a worker is generally entitled to benefits in New Jersey regardless of his fault in causing the accident, his claim can be denied if drug or alcohol intoxication caused the injury. You had a pre-existing injury. If you had a pre-existing injury to the same area of your body that was injured in a workplace accident, the insurance adjuster will most likely argue that the injury was caused by a reason other than your job. However, under New Jersey law, you have a right to file a workers’ compensation claim and should not be penalized for your prior injury as long as you can show you reinjured or aggravated a pre-existing injury in an accident on the job. You were laid off or fired. If you were laid off or fired before you filed your workers’ comp claim, the insurance company will be very suspicious of your claim—especially if you did not report your injuries promptly. This is another reason why you always want to report your accident immediately after it occurs. If you were injured in an accident at your job, do not let your employer’s denial of your workers’ compensation claim stop you from obtaining the benefits you deserve. Order my free book, What the Injured Worker Needs to Know, to start learning about your rights under New Jersey law. Then start an online chat to schedule a free, no-obligation consultation.